Area of geometric figures are very common in Civil Service Exams and also other types of examinations. Area is basically the number of square units that can fit inside a closed region. 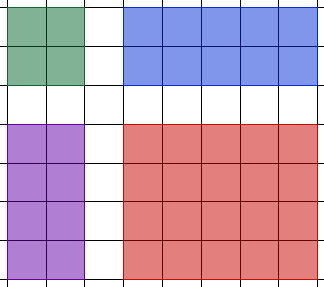 In a closed region, if all the unit squares fit exactly, you can just count them and the number of squares is the area. For example, the areas of the figures below are 4, 10, 8 and 20 square units. The figures blow are rectangles (yes, a square is a rectangle!). Counting the figures and observing the relationship between their side lengths and their areas, it is easy to see that the area is equal to the product of the length and the width (Why?). where is its area and is its side length. There are also certain figures whose areas are difficult to calculate intuitively such as the area of a circle, but mathematicians have already found ways to calculate the areas for these figures. 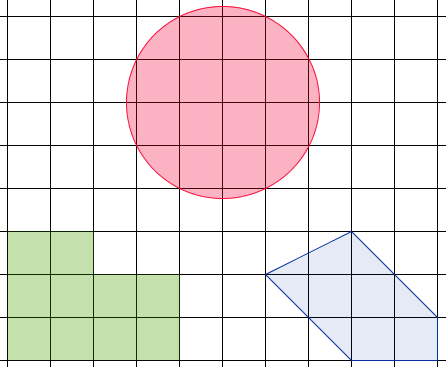 Challenge: Find the area of the green and blue figure below and estimate the area of the circle. Below are some formulas for the most common shapes used in examinations. Don’t worry because we will discuss them one by one. Triangle: , is base, is height. In this series, we are going to discuss the areas of the most commonly used figure in examinations and we will discuss various problems in calculating areas of geometric figures. We are also going to discuss word problems about them. Questions like the number of tiles that can be used to tile a room is actually an area problem.